A Day Late and A Dollar Short: Kindle Fire - Amazon Gold Box Deal of the Day! 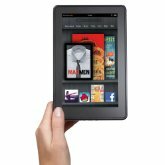 Kindle Fire - Amazon Gold Box Deal of the Day! Never seen Amazon do this before. Just in time for Mother's Day, save $30 on a Certified Refurbished Kindle Fire. Kindle Fire is the most-wished-for, most-gifted, #1 best-selling product on Amazon. Each Certified Refurbished Kindle Fire is a pre-owned Kindle Fire that has been refurbished, tested, and is certified to look and work like new. They come with the same one-year limited warranty as a brand-new Kindle Fire. This offer is valid today only, May 2, 2012, when sold by Warehouse Deals. Offer good while supplies last. Limit 5 per customer. Hmmm...Great deal. Why did this deal of the day come five days after my Mom bought the kids an iPad? To see this deal or to purchase, visit the Amazon Gold Box Deal of the Day website.